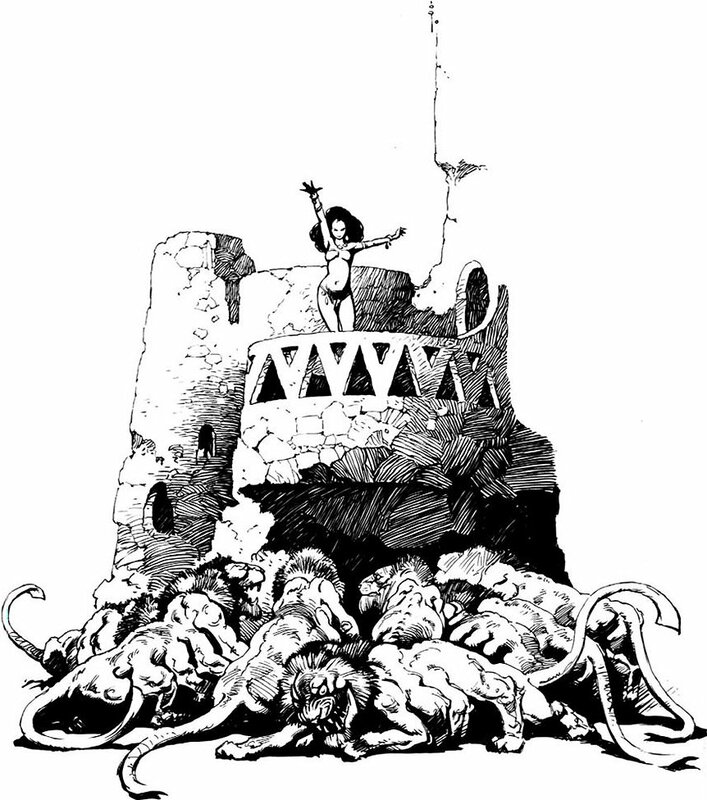 John Carter comes to the movies this week, completing an odyssey stretching back one hundred years, beginning with publication of A Princess of Mars in 1912. 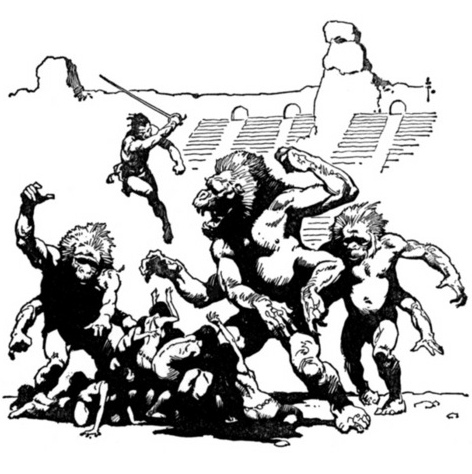 Created by Edgar Rice Burroughs — and vastly less successful than that author’s Tarzan of the Apes — the John Carter series has nonetheless fascinated geeks like me for a century, giving birth to the “sword and planet” genre, and having its bones mined by dozens of science fiction books and films to follow, most notably Return of the Jedi, where the whole first act owes more than a little to the airships and savage desert races of Burroughs’ Barsoom. … and some pretty special black & white interior art, too. Those covers and (especially) those interior drawings set the look and feel of John Carter for me, the tale of an ex-Confederate adventurer from Virgina who is mysteriously transported to Mars, where he is caught up in a whirlwind of swords, radium pistols, flyers, princesses, wild beasts, and the savage Green Men roaming the dead sea bottoms of Barsoom. 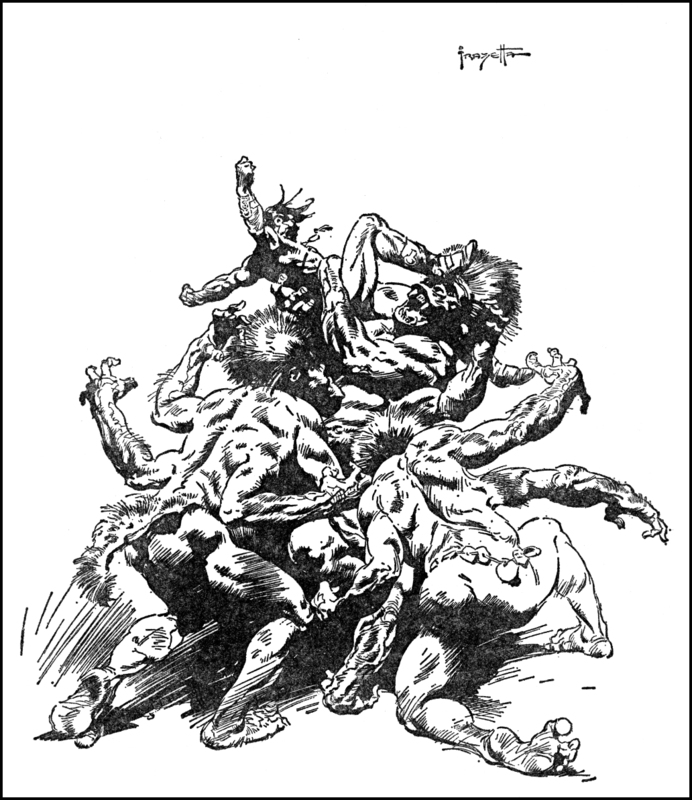 It’s not great fiction — unlike Robert E. Howard’s Conan series, I find little joy in Burroughs stiff, neo-Victorian approach to storytelling — but it is great world-building, right up there with the creations of J.R.R. Tolkien and Frank Herbert. On the eve of the movie’s release, it’s fruitless to speculate on it’s success — the tale will be told at the box office this weekend. But it doesn’t look good. Tracking numbers are weak and the knives are out for the film and the studio that greenlit the $250 million dollar production. For my part, I expect to like the picture (and I did — sort of — see the end of this post for my brief movie review). I respect director Andrew Stanton — I thought Wall-E was brilliant — and the footage released onto the web by an increasingly nervous studio adequately satisfies my fanboy expectations. The marketing has been tepid, with the studio distancing themselves from the term “Mars” for crazy reasons; likewise they have steered clear of the story’s post-Civil War period roots, probably spooked by the failure of last summer’s Cowboys & Aliens. 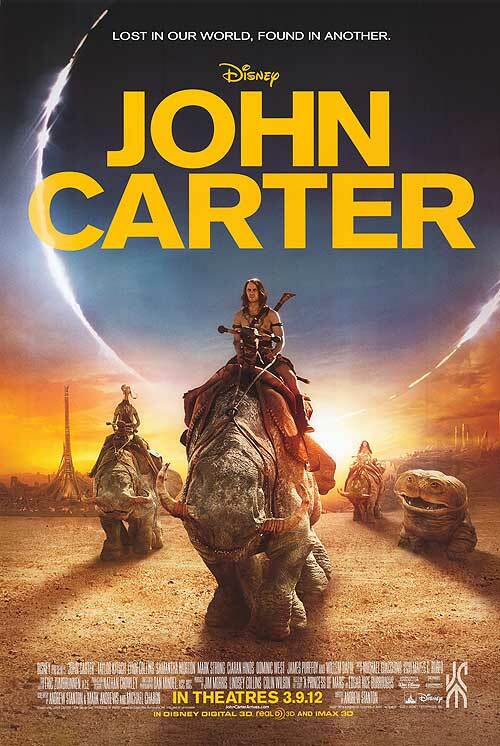 John Carter seems doomed to be another Scott Pilgrim Versus The World — a genre film that audiences like, but for which the audience was too small to sustain a franchise, which is a real shame, because Burroughs’ Martian saga is broad and rich enough to sustain several feature films. 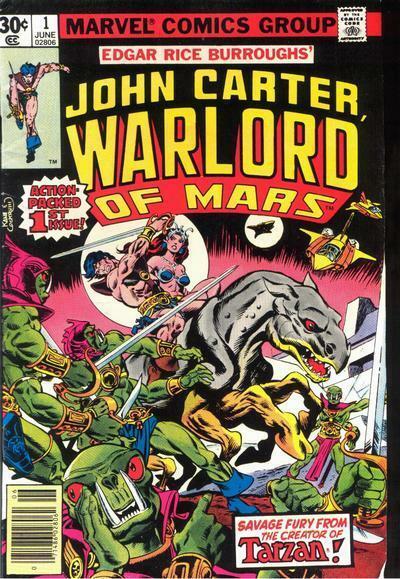 In 1977 the notion that I would some day get a John Carter movie — in a summer that will also bring me a Batman, Spider-Man, and Avengers movie — was more fantastic than John Carter slicing up a whole legion of the synthetic men of Mars. 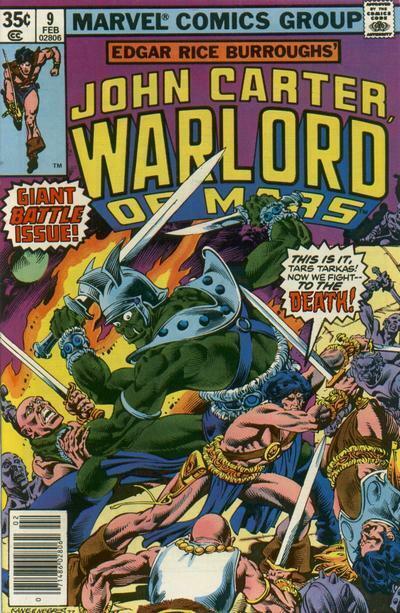 Three decades ago, the closest I could get to a John Carter movie was Marvel’s John Carter, Warlord of Mars comic series, and I bought every issue (and three annuals, too). And boy oh boy did they stink! I stayed with the book to the bitter end out of some misguided loyalty to the property but this run was terrible — terrible art, terrible storytelling, terrible design. Even the colors were terrible. And that the book was so poor despite the heartfelt efforts of some quite talented pros — like Marv Wolfman, Gil Kane, and Chris Claremont — points out how hard it is to get this story right (and simultaneously increases my respect for Frank Frazetta, even as it makes me that much more nervous for the movie). It seemed like a good idea at the time. 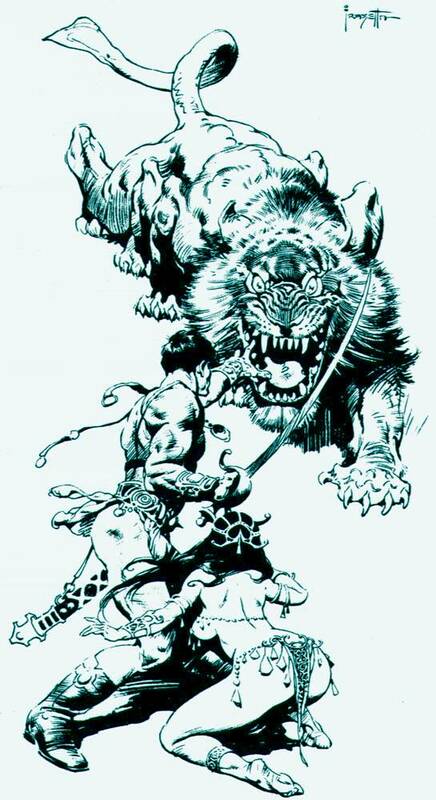 Marv Wolfman was one of the finest comic book writers of his day, and in the letter page editorial introducing the first issue, Wolfman says all the right things — how he’s loved the series since he was a boy, how he’s always wanted to do John Carter at Marvel, how Gil Kane was his perfect pick for penciller. He knew the books well enough to spot a multi-year gap buried between paragraphs at the end of A Princess of Mars in which to set his series, and he launched the book with an ambitious, twelve-part epic called “The Air Pirates of Mars” that showcased all the many weird races, landscapes, and creatures of Burroughs’ Mars. But sometimes the whole is less than the sum of its parts. 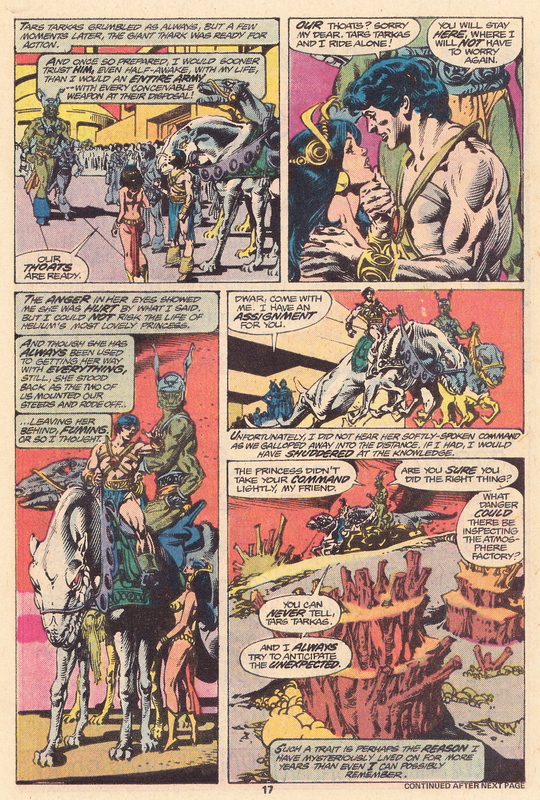 Wolfman never really made Barsoom his own — the humorless, first-person narration Burroughs uses is tiresome in the original books, and when Wolfman brings that style to the comic page it is positively deadly, offering little insight to the stoic John Carter while encumbering each page with a wall of words. So, too, do Gil Kane’s pencils fail to impress. I’m massively indifferent to Kane, but even his most ardent supporters will find little to like here, in page after page that seem a tangle of red bodies and snarling faces. 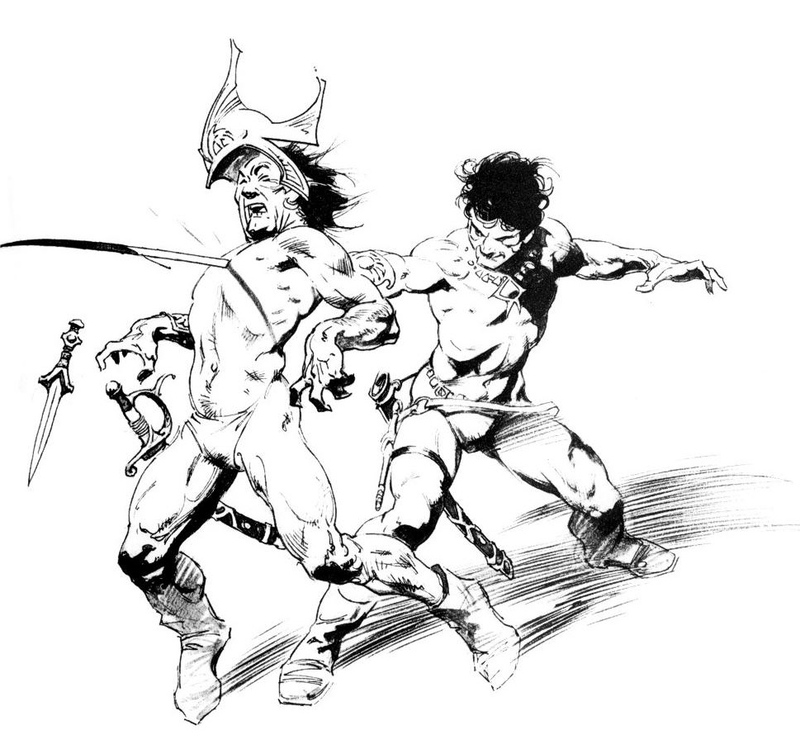 A John Carter artist must be a designer as much as a storyteller, and Kane was either incapable or totally disinterested in developing the look of John Carter’s world — his panels are almost entirely bereft of memorable architecture, costume design, or technology. There’s practically nothing about these pages that tells us we’re on Barsoom aside from a few extra limbs on the fauna. I re-read the series for this review and was appalled at how bland, dull, and lifeless were Burroughs’ creatures and characters when transferred to the comics page. In being so faithful to Burroughs, the series did Edgar a disservice, who even in 1977 was in need of an updating, but instead of cutting to the heart of Burroughs’ Barsoom — and giving us stories of romance, friendship, and loyalty — we get a kind of joyless Burroughs pastiche that fails by leagues to compare with the images that the novels conjured in my imagination. Wolfman departs after a dozen issues, and Chris Claremont does a bit better job as scripter. In Claremont’s first issue, John Carter is poisoned, and presumably killed, so Claremont dismisses the first-person narrative form, and the series is better for it … for all of half an issue, then Carter is back telling us nothing and the book is all grinding gears again. 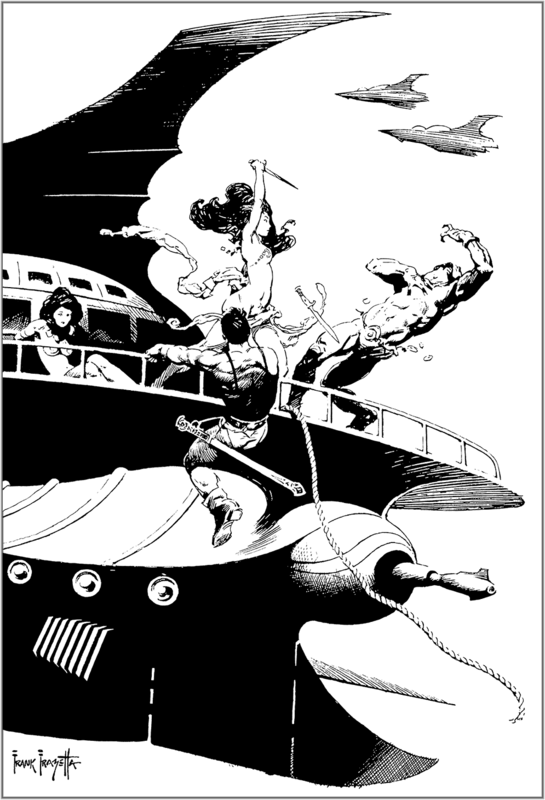 Like Wolfman’s tale, Claremont’s “Master Assassin of Mars” story arc is too long, and not helped at all by a second-rate effort from artist Rudy Nebres as the book runs out the string. … and a dynamic page from a young Frank Miller, just finding his way as an artist at Marvel. You also can find a few more decent pages over at the always-cosmic Mars Will Send No More … it’s too bad Alex Nino didn’t score a full-time gig on this book! 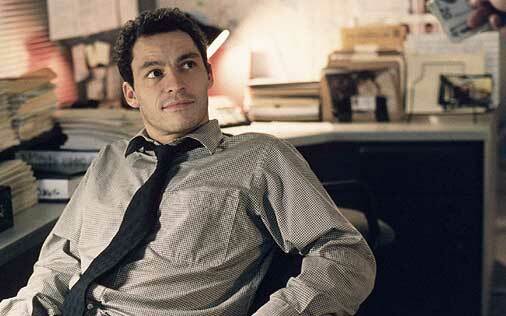 But really, this series is better left forgotten. 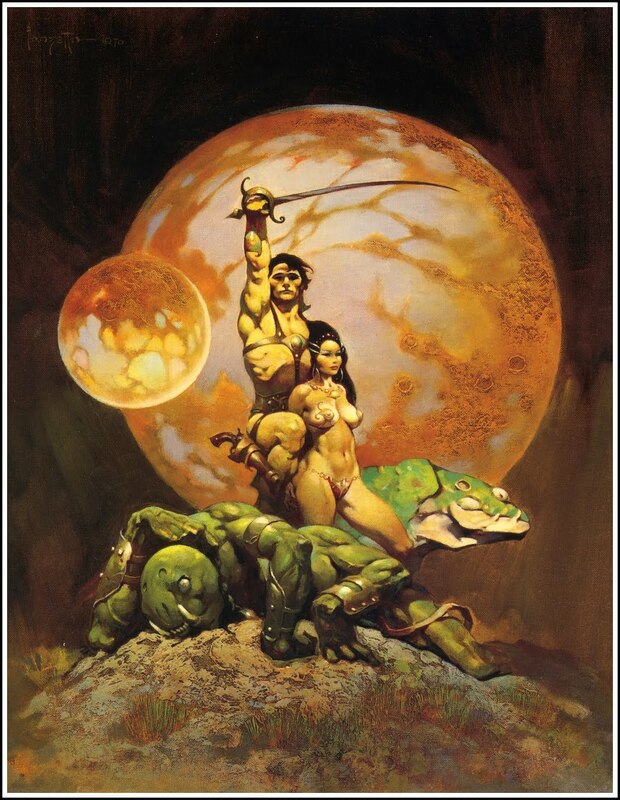 For lifeless scripting, uninspired pencils, anachronistic storytelling, and utterly failing to deliver on the promise of Burroughs’ rich Barsoomian mythos, Marvel’s John Carter, Warlord of Mars earns the first failing grade on the idiosyncratic Longbox Graveyard report card. 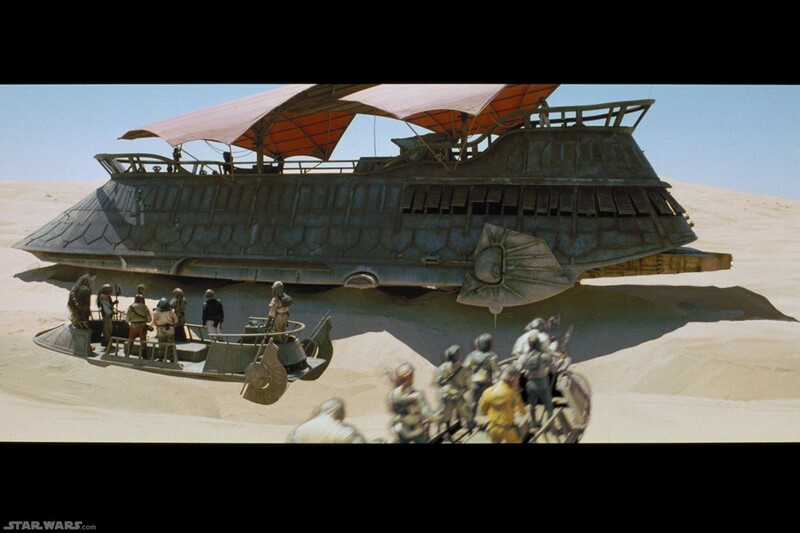 I’ve loaded my copies aboard a barge, set it aflame, and floated it down the River Iss … and am crossing the fingers on all four hands of my Tars Tarkas action figure that the great John Carter fares better in his feature film debut! 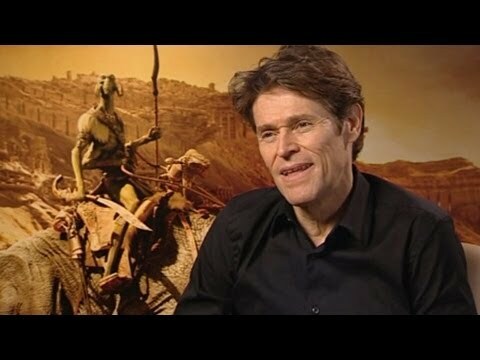 UPDATE: I’ve seen the movie now (in IMAX 3D no less) and while John Carter gets more things right than wrong, the things it does wrong pretty much kill it. I am stunned that Andrew Stanton (director of Wall-E) would get the heart and sentimentality of this story wrong, and it is deadly. 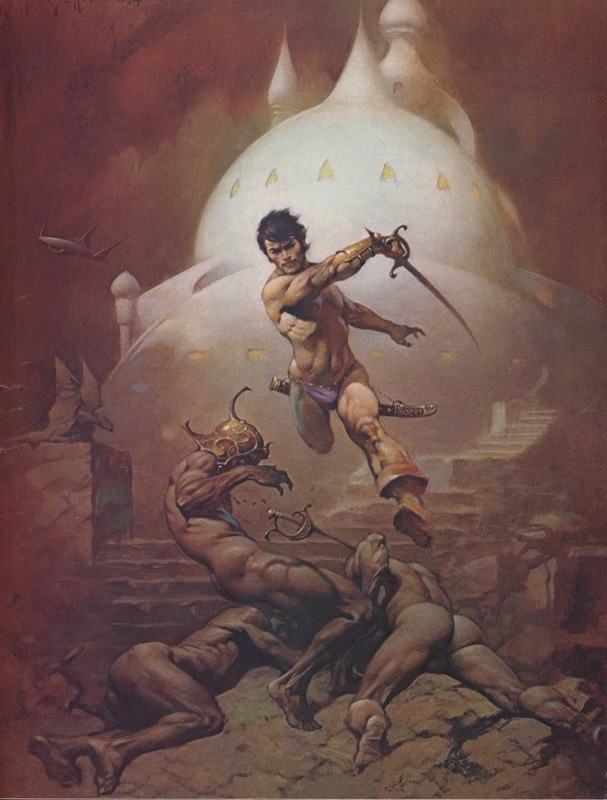 Instead of focusing on the warm emotional relationships between John Carter, Tars Tarkas, Sola, Woola, and Dejah Thoris, we get a complicated story where a Thern conspiracy and a well-intentioned but boring Edgar Rice Burroughs framing sequence crowds out screen time that would have been better devoted to core character development. The movie looks good, the Green Men are great, and I was fine with most of the casting (I thought the smart and resourceful Deja Thoris was an especially welcome revision). But the movie races along at a breakneck pace, too strident, too shrill, too eager to please, and ultimately a confused muddle of names and places and pointless details that just distance us from the heart of the story. The film looked like it needed another month in the editing bay (and maybe there will be a better cut on home video some day), but the damage is done. 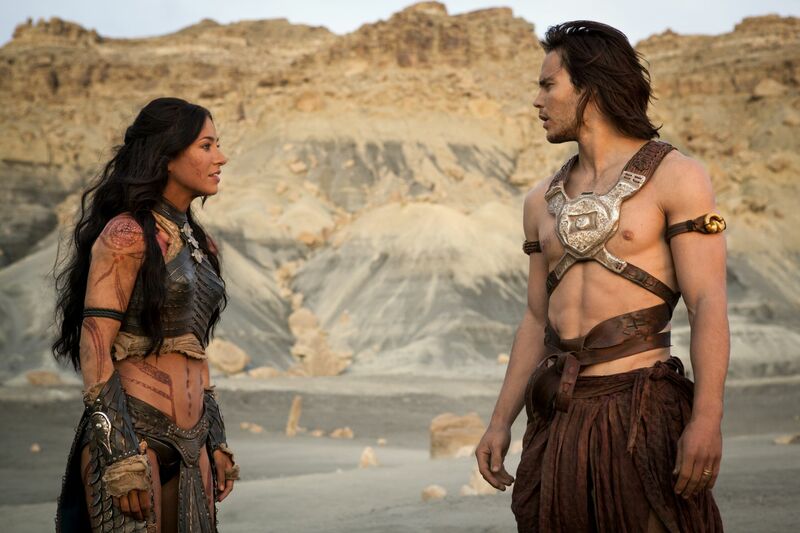 This film was doomed out of the gate by Disney’s catastrophic marketing campaign and with the movie underdelivering in it’s opening weekend (pending only some massive international box office), poor John Carter is going to be one-and-done. I’m disappointed and not a little depressed that this franchise has been smothered in the crib. It could have been great … but now it goes on the shelf with other promising misfires like Firefly, Rocketeer, and Scott Pilgrim. Pixar got the story wrong! Who’d a thunk it? So sad. NEXT WEDNESDAY: #39 Barsoomian Beat-Down!